RoGBC supported the “Affordable Homes. Energy Efficient Homes” conference, partnering with the Bursa Constructiilor Magazine to disseminate information about the event. Have a look on the official page of the conference in order to get some impressions and also if you are interested in getting an overview from the press that covered the subject. Under the umbrella of the Sustainable Energy Europe Campaign, the 4th edition of the EU Sustainable Week (EUSEW 2010) will, as in the past three years, provide a key reference point for sustainable energy issues in Europe. 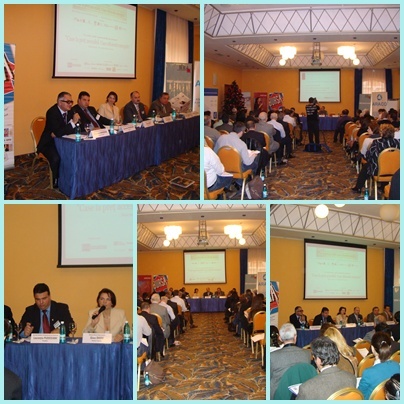 The event will take place in Brussels, Belgium, and in other European cities, including Bucharest, from Monday 22 to Friday 26 March 2010. The main discussion themes of this year’s EUSEW will be concerning Europe’s cities and their efforts in the fight against climate change. The winning projects will be handed the Award by the Commissioner for Energy at a prestigious Awards Ceremony which will be held in Brussels on the 23rd of March 2010 during the EU Sustainable Energy Week 2010. ARCHIBUS Solution Center Romania announces the launch of the Romanian Facility Management Association (ROFMA), a professional organization dedicated to raising the efficiency and profitability of property management and promoting best practices and technologies. ARCHIBUS Solution Center Romania (ASC-Romania) is the Romanian division of the American company ARCHIBUS Inc., world renowned real estate, infrastructure and facility management software manufacturer. “ROFMA will show the way in which companies can transform and enrich their operational efficiency through implementing good practices which will make them even more competitive on the market” said Tudor Trita, CEO of ASC-Romania, ROFMA and RoGBC founding member. The number of finalized residential units in Bucharest increased from 834 in H1 2008 to 1,041 in H1 2009, while in Ilfov County the residential units decreased by 13%, reaching 2,160 units shows a report elaborated by BNP Paribas Real Estate at the end of the first half of 2009. Along with information on the general evolution of the real estate investments, integrated in the contemporary economic context, the evaluation lead by the real estate company focuses on the five dimensions of the market: office, residential, commercial industrial and land. The authors of this report show that the pessimistic economic outlook and the negative general feeling of the real estate market have determined the contraction of the office segment. The office area finalized in H1 2009 was 17% smaller compared to the similar period of 2008, due to the delay with several months of projects proposed for delivery in H1 2009. The worsening of the business environment for retailers was proved by the obvious decrease of the trade volume in the first semester of 2009 compared with the same period of 2008. The drop fluctuated between -1.5% in January and approximately -18% in June. The rise in supply registered during H1 2009 was a result of the completion of projects initiated before the economic crisis, when the local market was facing a strong imbalance between demand coming from international retailers and the available commercial units. In H1 2009 the industrial segment was marked by the contraction of the leasing activity and low rhythm of completions. The majority of new modern facilities were medium-sized, with the logistic activities as main destination. In the land sector, even in the context of diminishing asking prices there are still major discrepancies in price expectations between buyers and sellers. Except the landlords who are experiencing financial difficulties, the other owners are not willing to lower the price below a certain level. The entire report is available for free download here. Anca Bieru, our Director for Memberships and Public Affairs talked about the possibility to create new jobs by directing the economy towards greener approaches to business. Taking “Ora Verde” (“Green Hour”) TV show as a message platform, Anca Bieru and Luminita Tanasie (WWF) discussed about the opportunities that derive from a green economy. This was part of a common effort of both the RoGBC and the WWF to raise awareness of the fact that the practical measures that can be taken for a green economy represent an investment for a sustainable economic future, and not budgetary costs.